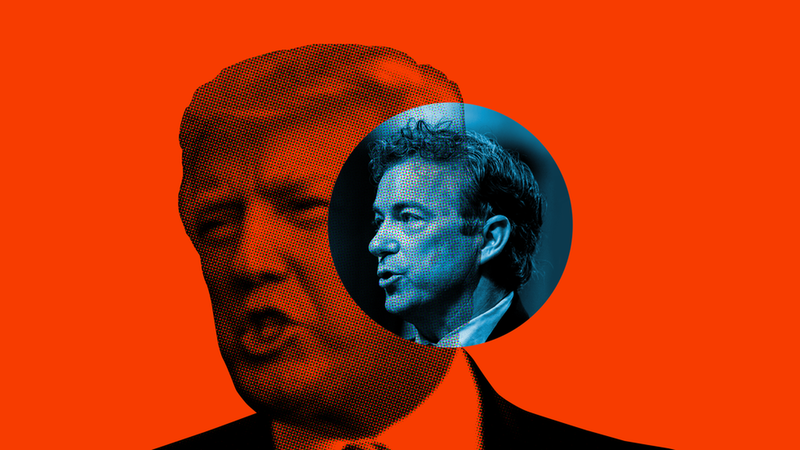 Donald Trump should hate Rand Paul. The Kentucky senator has opposed the president on just about everything; from the first GOP budget to tax reform to Syria strikes to Trump's Saudi Arabian arms deal to his Afghanistan policy to the debt ceiling and hurricane funding to multiple attempts to repeal and replace the Affordable Care Act. They could hardly disagree more. And Paul has stymied Trump's agenda at every turn — voting against the president's ACA replacement and fighting his beloved CIA director. But the two men have cemented one of the stranger relationships of the Trump reign. Based on a half dozen sources with front row seats to the odd couple, the enemy (Paul) of a bigger enemy (McConnell) can become one of Trump's few Senate friends. That, by the way, is a big problem for GOP leadership. Top Hill Republicans — as well as senior administration officials — are frustrated and concerned. It wasn't always this way. On the campaign trail, Trump tweeted that Paul was "truly weird" and "without a properly functioning brain." Paul, meanwhile, once called Trump an "orange-faced windbag." Despite all this, Trump calls Paul "my friend" — and it's mutual. Paul's spokesman Sergio Gor told Axios that the senator "considers the president a personal friend," noted that they speak several times a week and said Trump recently invited him for another round of golf. A source close to Trump puts it this way: "They'll talk on the phone and Trump will go on about Bedminster and golf and whatever else is going on; and Rand will drop in his libertarian ideas. And Trump will laugh and say, 'This guy's crazy. He doesn't care about anything. Doesn't care about Mitch. Doesn't care about anybody.' They won't even argue. He'll let him speak his mind." By the way: Of all 52 Senate Republicans, Paul gives leadership the most heartburn. But this doesn't seem to bother Trump, who actually relishes in Paul's antagonizing of the Majority Leader. Why this matters: Senior administration officials tell me they think Paul is playing them—that he gets all the perks of associating himself with the president without actually helping advance his agenda. "We've had this conversation recently," one senior official vented. "It's like, 'Wow, Rand really doesn't help us on anything.'" He spends a lot of time on the phone with him, listening patiently as Trump rattles on about his latest rounds of golf and, per one administration official, "all kinds of random stuff." He never asks for anything. Unlike other senators, who asked for tons of money for their states in return for their health care votes, Paul never asked Trump for anything. And he never suggested he would back the final health care bill. He plays nice. On TV, he never attacks the president personally or questions his moral center as others do. Instead, Paul couches his opposition in principled terms — bringing it back to deficits or the Constitution. He backed the travel ban. And Trump remembers. The view from Rand World: Gor said his boss "works closely with President Trump on countless issues, including working with him directly for months on expanding AHPs [association health plans], which we believe will happen next week." "However, proposals originating with congressional leadership to raise taxes on the middle class or pass Obamacare Lite do not fit with Senator Paul's positions nor an America First agenda," Gor said, referring to the health care and tax plans pushed by Trump and GOP leaders. Responding to internal frustrations about Paul's opposition, Gor said: "This perfectly illustrates the disconnect between some White House staff and President Trump. President Trump reaches out to Senator Paul, yet his staff plants fictitious narratives instead of advancing his agenda." Bottom line: The Paul-Trump relationship is the clearest example that for Trump, the most important thing — maybe even the only important thing — is personal chemistry. And that's a huge problem for McConnell, a quiet, steely operator who's allergic to bombast and who prefers twisting arms to slapping backs.